I guess it was a rebellious act of rekindling the love I have for who I am as an individual, but I was certainly disappointed in myself for a while there. What am I talking about? I recently cut my hair. I got a pair of scissors, and cut it all off. 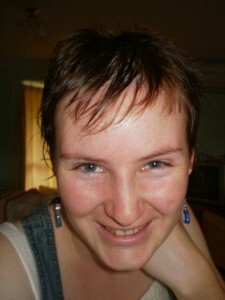 And I’m very happy with my home made hair cut, which I must admit has symbolised more then just a new look . It was a release from the dependence on approval from others, and the continual search for justification and connectivity to beautiful people who I could associate myself and my looks with. No matter what I would think of myself and what compliments I could get from my friends and family, I still felt the need to have the public reassurance from what I was seeing on television, in magazines – everywhere, and I didn’t necessarily like it, but definitely got caught up in it. Along side of this, I am getting married in June. I had people telling me that a bride wants long hair and that I’d regret cutting it off. Not this bride, but this opinion greatly disappointed me. Why can I not be a lovely bride with no hair? So when I took the plunge, I didn’t tell anyone. I don’t need their approval when the only opinion that matters is my own. I know that I’ll be a beautiful bride with short hair, and happy with myself because both myself and my partner love me for me, not my hair. Now it’s all gone, I feel released from the dependence on approval from others, even if it was only my own approval I was seeking. I’ve had a wave of beauty from within and have come to terms with the fact that I am beautiful for my personality, not my appearance. This is how I’m comfortable; without make-up, without styling products, without the ‘latest’ fashions… as me, in my own world of happiness and without concern for what everyone else is doing with their looks. My hair had just reached past chin length and admittedly, I was growing it not just because I haven’t had long hair for a long time, but to be like the pretty girls that I see everywhere. The beautiful actresses and T.V. personalities, people I admire in different roles. It had even gotten down to particular girls from school so many years ago that all had wonderful, long hair to go along with everything else so wonderful about them. I certainly admire other people, particularly women. There are many gorgeous women with many gorgeous features, but I have found the courage to love myself for who I am without any negative influence from others on what I should look like, or might need to change to be happy. And I am happy with my change and proud that I’ve found the strength to let go of the worries that I previously had. I enjoy my short hair and enjoy not feeling like I need to conform to what everyone else thinks is beautiful. I know I am. This entry was posted in Opinion and tagged body image, empowerment, hair cut. Bookmark the permalink.